© van Wijk et al. ; Licensee Bentham Open. To determine oral health related quality of life (OHRQoL) in a large sample of substance abusers and to evaluate the effect of dental treatment on OHRQoL. A dental care clinic specialized in treating severely addicted patients. A sample of severely addicted substance abusers. OHRQoL was measured using the OHIP-14, which was filled out at baseline (T0), prior to the first treatment session (T1), after about 6 treatment sessions (T2) and on the last day of treatment (T3). Mean OHIP scores did not change from T0 to T1. At T1, a mean OHIP-14 total score = 37.1 (sd=12.4, N = 392) was found. The highest mean scores were observed for the subscales physical pain and psychological discomfort. Data from 129 patients was available on both T1 and T2. The mean OHIP-14 total score reduced significantly (mean difference = 5.63, 95% CI 3.76 – 7.51), t(128)=5.94, p <0.001. The highest reduction in mean score was found for the subscale physical pain (mean difference = 1.24, 95%CI 0.81 – 1.66). Also between T2 and T3 a significant reduction in OHIP-14 total score (mean difference = 2.41, 95%CI 0.06-4.76) took place. The oral health status of substance abusers does have a substantial effect on their quality of life, which can be improved to a great extent by dental treatment based on a model tailored to addicted patients. Keywords: Dental treatment, Drug addicts, Oral health related quality of life, Special care dentistry. In medicine, mortality and morbidity no longer are the only important outcomes of prevention, cure and care. In the last decades, attention to patient-reported outcomes measures (PROM’s) such as health-related quality of life, has been growing rapidly . This is an acknowledgement of the fact that broader measures are needed, in order to incorporate the patients perspective on his health, impairments and disabilities. Also in dentistry nowadays, many instruments are available to measure oral health-related quality of life [2, 3]. One of the most commonly used instruments to measure oral health-related quality of life is the Oral Health Impact Profile (OHIP-49) or its short form alternative (OHIP-14). The OHIP-49  is based on seven dimensions derived from Locker’s conceptual model of oral health . An hierarchical ordering exists among these seven dimensions which implies that the impact described by each subsequent dimension is considered to be gradually more disruptive to one’s life . The concept of quality of life is intuitively appealing. That is, most people seem to have a sense of what it should mean, comparable for instance to a concept as intelligence. As a result, quality of life has found its way into several different fields of science such as sociology, medicine, nursing, psychology, economics, geography, social history and philosophy . Unfortunately, this has led to multiple definitions and meanings and therefore little consensus seems to exist on its definition and how to measure it , making it primarily a generic concept. In addition, quality of life is a dynamic concept . It reflects a subjective evaluation or appreciation of the degree to which someone is satisfied with life in general. This subjective evaluation is not necessarily consistent and the factors determining one's quality of life may differ within a person (compare for instance young and old people), but also between people (what seems important for one person may be irrelevant for another). Health in general, and also oral health, can be considered as universal factors that might have a profound influence on quality of life for most people. One special group in modern society is one in which general health, oral health, psychological wellbeing and thus quality of life are seriously deteriorated, are alcohol and drug abusers. Patients referred to a dental care clinic (in the Netherlands) specialized in treating substance abusers can be considered to be severely addicted. One study  showed that about 83% of patients reported having used heroin, 83% cocaine, amphetamine (23%) and hallucinogens (16%). About 90% of patients were poly-drug abusers and 46% of them were injecting drug users. From the patients that inject drugs, 90% had Hepatitis B, 90% had Hepatitis C, 30% were HIV positive and 13% had endocarditis. A single alcohol addiction was present in only 10% of patients. In addition to the aforementioned severity, the duration of the addiction is typically 8 years or more. Besides their addiction and associated general health problems, these patients also typically have an impaired psychological wellbeing . Nearly all patients suffer from some sort of psychopathology. About 95% has at least one type of disorder according to the criteria of the DSM-IV. In addition, research has shown that such patients report, on average, much higher levels of dental anxiety than the general population . Drug abuse also has a strong impact on oral health . One study has shown that substance abusers have higher DMFS scores than the general population, resulting from more active caries in fewer elements and less restorations [13, 14]. In addition, it is important to realize that psychotropic substances often leads to a reduced saliva production, thereby undermining the mouth’s natural defense mechanism [15, 16], resulting in an increased risk of developing caries. The large number of carious dental elements, in combination with the lack of regular oral health care, often leads to a severely mutilated dentition. The use of stimulants such as alcohol and cocaine can cause extensive bruxism resulting in attrition of the teeth [12-17]. Attrition in combination with impaired function due to missing elements may to lead to temporomandibular dysfunction . In short, pain as a result of active caries, fear of dental treatment, psychopathological disorders, and impaired aesthetic due to the lack of teeth, especially at the upper front, can clearly lead to a reduced quality of life. To our best knowledge, no studies exist that have examined OHRQoL in substance abusers. Therefore, the aim of this study was  to evaluate determine OHRQoL in a large sample of substance abusers, and  to investigate the effect of dental treatment, at a center for specialized dental care, on OHRQoL. Potential participants were patients on the waiting list for dental treatment at a special dental care clinic (CBT Jellinek) in Amsterdam. All patients were referred by approximately 200 different psychiatric institutions or departments that treat severely addicted patients from all over the country. The “Dutch Medical Research on Humans Act” (WMO) does not apply to the present observational study thereby relieving it from medical ethical approval. Nevertheless, the study was performed according to the regulations described in the Declaration of Helsinki. Data collection took place between November 2009 and November 2012. Treating severely addicted patients requires specialized knowledge and a treatment model that sets the preconditions for successful dental treatment. In the special dental care clinic (CBT Jellinek) from the present study, a very successful treatment model called “Molendijk” has been used for the last 15 years. In short, the Molendijk model describes a highly structured level of care, a set of agreements on making and attending appointments, the treatment plan, educational requirements for staff in relation to psychiatry and addiction etc. Treatment planning is phased, i.e. a stepwise execution of a flexible treatment plan taking into account the rehabilitation of the patient while considering harm reduction and re-socialization. In addition, prosthetic work and treatment aimed at esthetics is postponed, when possible, to the end of the treatment plan in order to prevent that patients may not return to complete the entire treatment plan. In general, the treatment plan that a general practitioner would make for an addicted patient is less elaborate than the treatment plan made for the non-addicted patient (for instance extractions rather than fillings) while the latter would aim to preserve as many natural teeth as possible . The OHIP-14 was used to assess OHRQoL. The Dutch OHIP-14 consists of two items from each of the seven subscales of the Dutch OHIP-49, which was recently translated . Subjects were asked for each item of the OHIP-14 how often in the past 4 weeks they have experienced a certain problem regarding their teeth, mouth or dentures. Answers were given on a 5-point scale, which was coded as follows: 5, very often; 4, fairly often; 3, sometimes; 2, hardly ever and 1, never. Thus, higher scores indicate a lower oral health on quality of life. The total score ranges from 14 – 70. The study consisted of 4 measurement points. T0 was a baseline measurement. Patients on the waiting list were sent a questionnaire at home to be filled out. This measurement served as a ‘control’ group, making it possible to detect any spontaneous improvements/deteriorations between T0 and T1. There was a large variation in the time between T0 and T1, ranging from only a few days to as much as two years (average = 169 days). T1 was the first day of treatment. At this point, directly prior to the first dental consult, an anamnesis questionnaire was filled out, along with the OHIP-14. At T2, a number of treatment sessions have taken place (on average 6 treatment sessions) and the OHIP-14 was filled out again. T3 was the last day of treatment and the OHIP-14 was filled out for the last time. Descriptive statistics were used to describe the patient sample. Mean differences on the set of subscale scores between different time points were tested using repeated measures MANOVA, followed by subsequent univariate analyses. Total OHIP-14 scores were compared between two time points using the paired samples t-test. The independent-samples t-test was used to test differences between independent groups. Distributions of categorical variables were analyzed using the Chi2-test. Pearson’s correlation was used as a measure of linear association. At the start of this study (T0), 400 questionnaires were mailed to potential participants that were on the waiting list of a special dental care clinic for alcohol/drug abusers (CBT Jellinek Amsterdam) for dental treatment. A total of 110 usable questionnaires (27.5%) were returned. Given that the expected drop out rate among these patients would be high, questionnaires were handed out to new patients (at T1) until a large enough sample size was achieved. A total of 403 questionnaires were filled out at T1, resulting in 392 usable questionnaires (44 participants out of 110 at T0 filled out a questionnaire at T1 as well). About 82% were males with a mean age of 47.5 (s.d. = 8.2). 138 participants (35.2% out of 392) also filled out the questionnaire at T2 (136 usable), and 82 participants (20.9%) at T3 (81 usable). Fig. 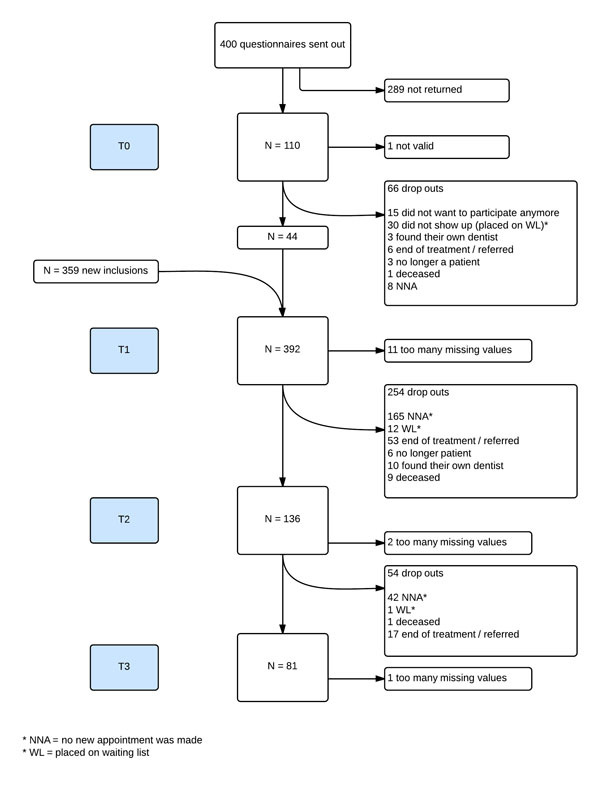 (1) shows a flow diagram of participants across the 4 measurements along with reasons for drop out. On average, participants had about 24 teeth (s.d. = 7.4) when presenting for treatment at T1. 31.4% had 10 or more missing teeth. Between T1 and T2, 29% of patients received root canal treatment m = 1.4, s.d. = 0.7). In 72.4% of patients fillings were made (m = 4.3, s.d. = 3.5), and about 11% received a (partial or full) denture, or had repairs concerning an existing prosthesis. Extractions were performed in 69.6% of patients (m = 3.8, s.d. = 3.3), with a maximum of 11 extractions in one patient. Mean treatment time between T1 and T2 was 263 min (s.d. = 102) with a minimum of 100 and a maximum of 510 min1. Between T2 and T3, 6% of patients received root canal treatment, all received one root canal treatment. In 55.6% of patients fillings were made (m = 2.7, s.d. = 2.0), and 7.5% received a (partial or full) denture, or had repairs concerning an existing prosthesis. Extractions were performed in 40% of patients (m = 1.9, s.d. = 1.4), with a maximum of 4 extractions in one patient. Mean treatment time between T2 and T3 was 110 min (s.d. = 74.8) with a minimum of 15 and a maximum of 300 min. Mean OHIP-14 total- and subscale scores were calculated, and are presented in Table 1 (column T0). ANOVA for repeated measures showed a significant difference between subscale scores, F (6, 104) = 28.98, p < 0.001. Subsequent analysis shows that the lowest mean score is reported for the subscale functional limitation (p < 0.015 relative to all other subscale scores). A significant higher mean score is noted for the subscales physical disability, social disability and handicap (p < 0.001). The highest scores are reported on the subscales physical pain, psychological discomfort and psychological disability (p < 0.02). Mean OHIP-14 (subscale) scores and standard deviations for all data available at each measurement. 1 = lowest score, significantly different from each higher number. 2,3,4 = in the same column, scores with the same number do not differ significantly from each other. In order to test for a (natural) change in OHRQoL scores between T0 (waiting list) and T1 (first day at the clinic), paired samples t-tests were performed on total- and subscale scores. A strong association exists between scores at T0 and T1 (lowest correlation r = 0.61, N = 44, p < 0.001), but no significant differences on total- or subscale scores (range p-values = 0.26 – 0.72). One exception is the subscale physical disability, where a marginally yet non-significant decrease in mean score was found, mean difference = -0.45 (s.d. = 1.74), t (43) = 1.71, p = 0.095.
that did respond on T0 (mean difference 0.73), but this became non-significant after correcting for unequal variances (significant Levene test), t (50.02) = 1.93 p = 0.059. Non-parametric analysis confirmed this conclusion (Mann-Whitney U), Z = -1.785, p = 0.074. Flowchart of participants across T0 through T3. At T1, participants visit the special dental care clinic for the first time. As such, it provides an opportunity to assess the impact of oral health on their daily living before start of dental treatment. A total of 392 filled out questionnaires were available. Mean OHIP-14 total- and subscale scores were calculated, and are presented in Table 1 (column T1). ANOVA for repeated measures showed a significant difference between subscale scores, F (6, 386) = 134.8, p < 0.001. Subsequent analysis shows a similar pattern as found at T0. From low to high, the lowest mean score is reported for the subscale functional limitation (p < 0.001 relative to all other subscale scores). A significant higher mean score is noted for the subscales physical disability, social disability and handicap (p < 0.001), followed by a higher mean score on the subscale psychological disability (p < 0.001). The highest mean scores are reported on the subscales physical pain and psychological discomfort (p < 0.001). In order to test the effect of dental treatment, mean subscale scores available at T1 and T2 were compared using a repeated measures MANOVA. Results show a significant multivariate effect for the within-subjects factor, F (7, 122) = 7.23, p < 0.001. Subsequent univariate analyses shows that a significant improvement (i.e. a reduction of mean scores) was found for all subscale scores. The paired-samples t-test also showed a significant improvement in OHIP-14 total score (Table 2). Mean OHIP-14 (subscale) scores and standard deviations at T1 and T2 (N = 129). Mean subscale scores available at T2 and T3 were compared using a repeated measures MANOVA. Results show a significant multivariate effect for the within-subjects factor, F (7, 68) = 2.65, p = 0.018. Subsequent univariate analyses shows that a significant improvement (i.e. a reduction of mean scores) was found for the scores on the subscales psychological discomfort and psychological disability. Mean OHIP-14 total scores available at T2 and T3 were compared using paired-samples t-tests (Table 3). Again, a significant improvement for the total scale was found. Mean OHIP-14 (subscale) scores and standard deviations at T2 and T3 (N = 75). In the present study, OHRQoL was examined in a large sample of substance abusers using the OHIP-14. Data from 392 patients was available at T1. Results show that the impact of oral health on these patients (mean OHIP-14 score = 37.1, s.d. = 12.4) can be considered to be substantial. That is, it appears substantial if the mean scores found in the present study are compared to those found in other studies using different samples. For instance, in a study concerning the impact of third molar surgery on OHRQoL in the first postoperative week a mean OHIP-14 total score of 34.3 was found . This suggests that the sample in the present study reports to experience more impact of oral health on quality of life (at T1) than patients that have just undergone third molar extraction surgery. Also patients suffering from a dentofacial deformity that requires orthognathic surgery score lower (mean = 34.97) than the present sample . The same is true for patients with general periodontal problems and severe periodontitis . Please note that one needs to be very careful with comparisons as given here  since each patient sample is characterized by its own specific problems. A generic instrument such as the OHIP-14 may not fully capture the impact of such specific problems, thereby preventing a valid comparison. As formulated by other authors “No single instrument can be regarded as a standard, comprehensive instrument for measurement of OHRQoL” . However, it does give the reader a general impression of the impact of oral health on the current sample. For instance, the mean OHIP-14 score for the general Dutch population is 16.8  which is substantially lower than found in the present sample. Despite the fact that only a limited number of treatment sessions took place (6 on average), dental treatment (between T1 and T2) resulted in a significant reduction in mean OHIP-14 total- and subscale scores. It is clear that treatment at the dental care clinic specialized in substance abusers had beneficial effects for patients in terms of improved oral health related quality of life. The authors believe that the Molendijk treatment model plays a crucial role in this beneficial effect. A significant reduction in mean OHIP-14 total- and subscale scores was also found when comparing T2 with T3, albeit much less than expected (31.95 vs 29.54). Several explanations can be given for this relatively modest improvement. One important explanation relates to the fact that many patients did not complete the study. It appears, and was anticipated in advance, that patients who improved substantially (for instance pain free, restored upper front teeth, partial prosthesis etc) quite often did not return to complete treatment. In other words, when patients are relieved from their most serious problems, they will also experience a reduced need to comply with treatment. Another related explanation is that a part of the patients did not return for a long time, but when they did return it was because of newly acquired dental problems. For instance, alcohol abusers and drug abusers in general, who experience withdrawal issues, often fall and break parts of their dentition, and return to the clinic with increased OHIP-14 scores relative to when they left. Other examples are patients that had their (partial) denture repaired, had to go to jail for one year, and returned with a broken denture. One final explanation is related to the Molendijk treatment model. Since it is known that substance abusers have a tendency not to comply with treatment after their largest dental problems have been solved, one rule of the Molendijk model is to wait (when possible) with placing of (partial) dentures until the final day of treatment. As a result, a part of the patients only received their denture at T3. As such, their score does not reflect the benefits of their new dentures, but is based on a (partly) edentulous mouth. One important limitation to the present study is the high dropout rate of patients. A total sample of 392 patients participated at T1, and only 81 remained at T3. However, this was anticipated and the main reason for including as much patients as possible given the time frame for the study. For instance, during the study period 11 patients deceased. However, as reasoned above, the authors believe that dropout is primarily related to a substantially improved OHRQoL which often results in decreased compliance with therapy. Therefore, the authors feel that the results presented for T2 and T3 are likely to give an underestimation of the effect of dental treatment on these patients. It may be clear that the present population is hard to reach and follow, in particular with a longitudinal study design. The fact that only patients referred to one special dental care clinic in Amsterdam participated does not necessarily limit the generalisability of the results, since patients are referred to this clinic from all over the country. However, it does concern a sample of severely addicted patients (i.e. using drugs for a long time) with psychopathological problems (most were referred by a psychiatrist from the abuse treatment center). The question whether these results apply to substance abusers in other countries remains to be seen. The Netherlands is a country with a highly developed social system providing support for the weakest in society. In other words, a large part of the substance abusers in the Netherlands has a house, a smaller part has work, and all have access to dental care and health care. In countries where the social system is less developed, substance abusers may be more likely to be without a job, live on the streets more often and have no or limited access to dental and general health care. One additional limitation is that in the current study no standardized measures of oral health status were obtained (i.e. DMFT, caries index, periodontal index, tooth mobility etc.) as was done in other studies . In future studies, such information should be considered as it gives a more differentiated picture and will allow for specific subsample analyses. To conclude, the results from the present study show that dental treatment has a substantial positive effect on OHRQoL as measured using the OHIP-14. An important result given the observation that general practitioners would treat an addicted patient differently from a non-addicted patient . That is, for an addicted patient the general practitioner would more often extract a teeth than fill it, and would more often propose to use fillings and partial dentures rather than using crowns and bridges. However, results from the present study show that addicted patients can benefit to a great extent from ‘conventional’ dental treatment when following a treatment model specifically tailored to addicted patients. Moreover, it is important to realize that psycho-active drugs mask bodily pain signals. It is the moment of withdrawal that the addicted patient has the severest dental pain. Therefore, it is advisable to plan dental treatment, if possible, just before or in the beginning of the withdrawal or therapy. Dental treatment should be integrated in addiction programs to reduce drug-related harm and to optimize re-socialization of the addicted patient. 1 Treatment time includes not only the time needed for dental treatment, but also the time needed for managing the patients psychopathologies or anxieties. Moons P, Budts W, De Geest S. Critique on the conceptualisation of quality of life: a review and evaluation of different conceptual approaches. Int J Nurs Stud 2006; 43(7): 891-901. Hebling E, Pereira AC. Oral health-related quality of life: a critical appraisal of assessment tools used in elderly people. Gerodontology 2007; 24(3): 151-61. Skaret ST, Ãstrøm AN, Haugejorden O. Oral Health-Related Quality of Life (OHRQoL) Review of existing instruments and suggestions for use in oral health outcome measure research in Europe. European Global Oral Health Indicators Development Project 2013. Locker D. Measuring oral health: a conceptual framework. Community Dent Health 1988; 5(1): 3-18. Kieffer JM, Hoogstraten J. Linking oral health, general health, and quality of life. Eur J Oral Sci 2008; 116(5): 445-50. Farquhar M. Definitions of quality of life: a taxonomy. J Adv Nurs 1995; 22(3): 502-8.
 van Wijk AJ. Quality of life is a dynamic concept. Ned Tijdschr Tandheelkd 2011; 118(3): 126-8. Amsterdam JV, Pennings E, Brunt T, van den Brink W. Physical damage due to drug dependence (ZonMW study). National Institute for Public Health and the Environment (RIVM report 340041001/2012); 2012.
 von Limbeek J, Wouters L, Kaplan CD, Geerlings PJ, von Alem V. Prevalence of psychopathology in drug-addicted Dutch. J Subst Abuse Treat 1992; 9(1): 43-52.
 ter Horst G, Molendijk G, Tjong EJ. Dental referral of drug addicts. Ned Tijdschr Tandheelkd 1994; 101(10): 406-8. Fazzi M, Vescovi P, Savi A, Manfredi M, Peracchia M. The effects of drugs on the oral cavity. Minerva Stomatol 1999; 48(10): 485-92. Molendijk B, Ter Horst G, Kasbergen M, Truin GJ, Mulder J. Dental health in Dutch drug addicts. Commun Dent Oral Epidemiol 1996; 24(2): 117-9. Molendijk B, ter Horst G, Kasbergen MB, Truin GJ, Mulder J. Dental health in drug and alcohol addicts. Ned Tijdschr Tandheelkd 1995; 102(8): 296-8. Di Cugno F, Perec CJ, Tocci AA. Salivary secretion and dental caries experience in drug addicts. Arch Oral Biol 1981; 26(5): 363-7. Lee CY, Mohammadi H, Dixon RA. Medical and dental implications of cocaine abuse. J Oral Maxillofac Surg 1991; 49(3): 290-3. Friedlander AH, Gorelick DA. Dental management of the cocaine addict. Oral Surg Oral Med Oral Pathol 1988; 65(1): 45-8. Winocur E, Gavish A, Volfin G, Halachmi M, Gazit E. Oral motor parafunctions among heavy drug addicts and their effects on signs and symptoms of temporomandibular disorders. J Orofac Pain 2001; 15(1): 56-63.
 ter Horst G, Molendijk B, Brouwer E, Verhey HG. Differences in dental treatment plan and planning for drug-addicted and non-drug-addicted patients. Community Dent Oral Epidemiol 1996; 24(2): 120-3.
 van der Meulen MJ, John MT, Naeije M, Lobbezoo F. The Dutch version of the Oral Health Impact Profile (OHIP-NL): Translation, reliability and construct validity. BMC Oral Health 2008; 8: 11.
 van Wijk A, Kieffer JM, Lindeboom JH. Effect of third molar surgery on oral health-related quality of life in the first postoperative week using Dutch version of Oral Health Impact Profile-14. J Oral Maxillofac Surg 2009; 67(5): 1026-31. Lee S, McGrath C, Samman N. Impact of orthognathic surgery on quality of life. J Oral Maxillofac Surg 2008; 66(6): 1194-9. Ng SK, Leung WK. Oral health-related quality of life and periodontal status. Community Dent Oral Epidemiol 2006; 34(2): 114-22. Cicciù M, Matacena G, Signorino F, Brugaletta A, Cicciù A, Bramanti E. Relationship between oral health and its impact on the quality life of Alzheimer’s disease patients: a supportive care trial. Int J Clin Exp Med 2013; 6(9): 766-72.